Shisaku: Trying A Little Machiavelli, Mr. Suga? The Abe Administration has been hitting a rough patch of late. Abe Shinzo allies have been torching the government's credibility. Attempts at damage control have been eating up the PM's and the Chief Cabinet Secretary Suga Yoshihide's time and attention. I am perhaps not alone in being puzzled at how poorly the Abe Administration has been handling a string of embarrassments, after being almost impervious to scandal during its first year in office. Most surprising has been the seeming passivity of Suga. As each new nonsensical, indefensible situation has rolled up, he has dismissed it with an airy "oh, so-and-so was just stating a private opinion" or "there is nothing legally wrong with what X-san has done" -- as if he were unaware how his excuses were undermining his reputation as a super-competent manager and spokesman. "If you can't see the point of your opponent's move, assume there isn't any." However, what has been perplexing in the case of Suga has not been his choice of moves. It has been his lack of movement. In a more orderly and business-like world -- the world of the first year of the Abe Cabinet, let us say -- Momii Katsuto, Hasegawa Michiko and Hyakuta Naoki would all have resigned from their NHK positions by now. Nothing would be allowed to fester and serve as a distraction from the overall, multi-year march toward a more powerful Prime Minister's Residence and a more powerful Japan. Suga, after a year when he seemed in total command, seems lethargic and reactive, letting the news cycle and scandal swallow up the agenda. "If you can't see the reason for your opponent's inaction, assume there is one." So let us assume that Suga Yoshihide is appearing wan and listless on purpose. Why would he want to do this? According to the narrative published in the Yomiuri Shimbun late last year, Abe humiliated Suga in December, rejecting Suga's pleas to not go to Yasukuni. In the account of what took place before and on December 26, Suga simply swallowed his pride and set about composing an apologetic statement for Abe to read after the Yasukuni sanpai. But what if Suga did not simply swallow his pride? What if, in suitable pique, he decided to let just Abe run things for a while, making insincere excuses for Abe's buddies violations of The Prime Directive -- "only Abe Shinzo gets to burn Abe Shinzo's political capital"? What if Suga were simply just letting the Abe Revolution falter, just to remind a too-big-for-his-britches Abe who the de facto prime minister is? Abe today is off for Sochi, Russia, set to have a tête-à-tête with President Vladimir Putin in concert with being one of the few Western Alliance leaders to attend tonight's Winter Olympics opening ceremony. Today is, by unfortunate coincidence, Northern Territories Day -- the day when the government reminds all of us of its failure to heretofore win back the four islands and collection of islets of the Southern Kuriles, lost to the Russians in 1945. It is well-known that one of Abe's main goals is a peace treaty with Russia, finally ending World War II. It is second in importance only to the revision of the Constitution, on a par with the economic revival of the nation. It is also well-known that not even a judo-loving and nearly untouchable Putin is thinking of conceding the reversion of all of the Southern Kuriles/Northern Territories. Signing a peace treaty will require Abe to sacrifice, accepting the return of at best Shikotan and the Habomai group -- basically the same deal Japan was offered and which it rejected in 1956. Letting the revisionist crazies run amok for a while prepares the foundation for a searing betrayal of these same crazies and their principles "for the good of the nation." From a theatrical point of view, it is after the fanatabulists make a hash of things that Abe/Suga can stab them in the back with a "half-a-loaf is better than nothing" solution for the vexing problem of the peace treaty, ignoring rightist demands for every square centimeter of the Southern Kuriles and nothing less. In other words, Suga, either with or without Abe's consent, is letting Abe's most dangerous and frivolous friends make fools of themselves so that he can bin them when it is time for the adults to sit down and cut a few deals. So perhaps the deterioration of the Abe Cabinet governance this winter is not a bug. Maybe it is a feature. I think you are wrong and this sounds like secondary rationalisation of the unthinkable. I would be very surprised if what you propose is in fact Suga's way to get revenge. 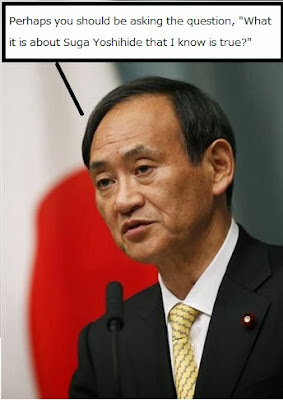 I think he simply scared by the speed in which Abe is turning back the clock to a pre-WWII mindset. In a country with a de-facto Gestapo (the Yakuza/Uyoku mob operating under the government's eye), it is becoming increasingly dangerous to one's life to speak out against the right-wing. He's simply concerned about his well-being. Your description of the relationship between the two men is not impossible. However, your characterization is encased in a rather dark vision of the country. Historical analogies are tricky, but I think the "Yakuza/Uyoku" mob perform a role more that like of the SA than the Gestapo.